The National Sheriffs' Association (NSA) named the Marion County (SC) Sheriff's Office (MCSO) the 2018 recipient of its Crime Victim Services Award. The award recognizes outstanding achievement by a sheriff's office in support of victims, and is sponsored by Appriss Safety, a leading provider of victim notification services and developer of the VINE service (Victim Information and Notification Everyday). The MCSO, led by Sheriff Brian Wallace, has proven itself a leader in the field of victim advocacy in South Carolina. VA Erwin helped bring Sheriff Wallace's goal of bridging the gap between the community and the MCSO by making the department more child-friendly, as well as facilitating the deputies' involvement in community activities, such as school functions, community groups, and ceremonies. Sheriff Wallace's mantra is "We want our community to meet us before you need us," and the MCSO's revamped Victim Advocate Program was built directly on that foundation. One of the MCSO's defining accomplishments under Sheriff Wallace has been the arrival of Caj, the department's therapy dog for crime victims. MCSO is the first sheriff's office in the state to provide an on-staff therapy dog to victims and staff. Caj comforts and serves crime victims daily—in the office, in court, and out in the community. Caj represents yet another opportunity for the community to interact and get comfortable with MSCO officials before they are needed in a time of emergency. The NSA established the Crime Victim Services Award in 2005 with initial funding from the Office for Victims of Crime. The award has been sponsored by Appriss since 2008. "We are once again honored to partner with the NSA to sponsor this distinguished award," said Mr. Josh Bruner, President of Appriss Safety. "We are inspired by Sheriff Wallace and the dedicated officials of the MCSO; we are grateful for the NSA's reputable platform upon which we are able to appropriately honor their victim service efforts." On behalf of his department, Sheriff Wallace is "profoundly honored" to accept this year's award. "We haven't reinvented the wheel when it comes to victims services; we simply put it in motion. Our goal is to empower crime victims with knowledge about their case and the overall judicial process. Organizations like the NSA and Appriss Safety make our jobs easier with their resources and support." 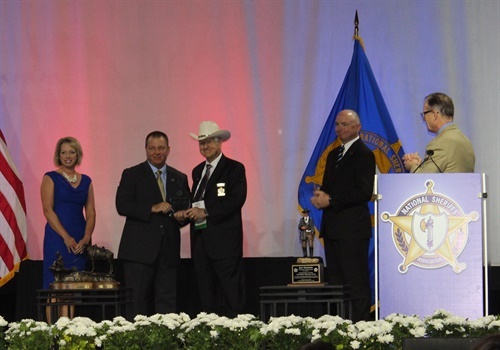 Bruner and NSA officials presented the award to Sheriff Wallace at the NSA's Annual Conference and Exhibition in New Orleans, LA, on June 18. For more information, visit ApprissSafety.com.